Can one of the Mods please move all the Kii 3 posts to the Kii Three Speaker thread? Thanks Anthony, I was thinking the same. Just hadn’t asked yet. Agree with you. There is already a Kii3 thread. This is the first time I have seen this written down anywhere. Most interesting if true (can you reference any listening tests to back it up?). In a recording studio environment, how do you you judge what something will ‘sound’ like at home if the size of the woofers in your monitors (of whatever brand) play a part in what you are mixing the bass level at? I know this is an old thread, but I’m contemplating Kii Three, and would need something to feed them. The Roon Nucleus sounds very appealing, after adding an internal SSD. Can you share your experience? microRendu (Sonore) plugged into the Kii Control via USB works fine here. The combination works perfectly ,just plug the Kii Control into the Nucleus, the control is instantly recognised. @Chris_Valle I use a Nucleus+ plugged directly into the Kii Control on our work system, works brilliantly. I own a Nucleus at home and long term plan is to add a set Kiis to the home system. Right now, the biggest drawback IMO is no Kii Control volume from within Roon. At the same time, it also pretty much guarantees it won’t go off script and blast full volume, but it’d be nice to have. And also the warranty is not transferable - something to bear in mind especially if buying used. 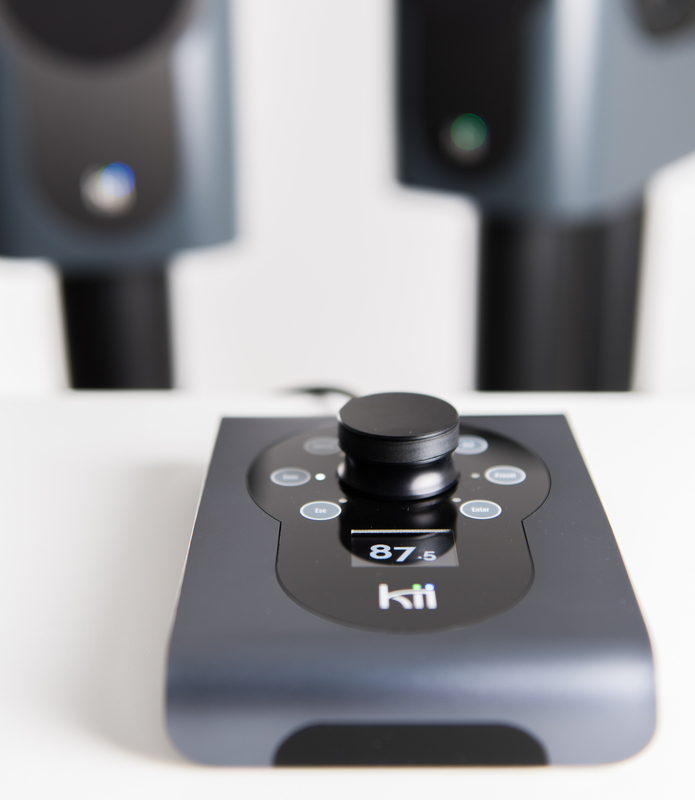 The Kii Control is not meant to be run by cable through the room - it is IR capable. I have to say, I also found the control design a bit odd. Much better to have a battery powered wireless remote with volume knob function buttons and screen, and a separate box with inputs and cat5 to speakers. Combining the two means the remote can’t necedsarily be where you want it, and as far as I understand the control features aren’t backed up by an app or anything so it doesn’t seem like a device you’d want stuck in the corner of the room. Yes you can IR the volume, but not all the other features. I also found the control design a bit odd. You saying you don’t remotely adjust features when hanging from the ceiling ? You can switch inputs, but, for whatever reason, not presets. I use the Apple remote with my ‘control’ youcan adjust, volume, mute and select input. Once you have set all the speakers parameters with the ‘control’ on your lap, for day to day use I find I really only need input, and volume. I don’t think it’s odd that the Kii Control is “wired” - it’s really something more akin to a digital preamp. That said, I do wish they had also come up with something like the Devialet remote volume knob/control. That’s really what a device like the Kii should have. There have been rumors for a couple of years that they are working on a larger Kii Control with more features; but no concrete info about it has ever come up. for day to day use I find I really only need input, and volume. Of course that 640K ought to be enough for anybody, and that in the real world, pretty much all you do is change inputs and volume. And since the thing is angled up, who needs to see which of 3 or 4 inputs you’ve selected from your sitting position, right ? Or where the volume is at ? Or change presets, because who in their right mind does home cinema integration ? It’s certainly perfect for those commanding them from a desk, but it really feels like home use was a bit of an afterthought.